Homebuyer's School is your resource to better understand the entire home buying process and make the best decision when purchasing your next home. Home buying can be overwhelming, there’s so much information out there and you might not know where to begin. 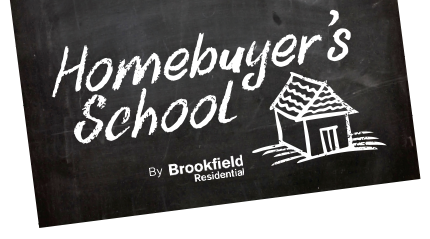 If you are feeling worried or exhausted about your home purchase then Brookfield Residential’s Homebuyer's School can help. It's where industry experts share their knowledge to help you make the best decision when buying a home. Our first priority is providing you the tools and know-how so you can find your perfect home regardless of where your home-buying journey can take you.